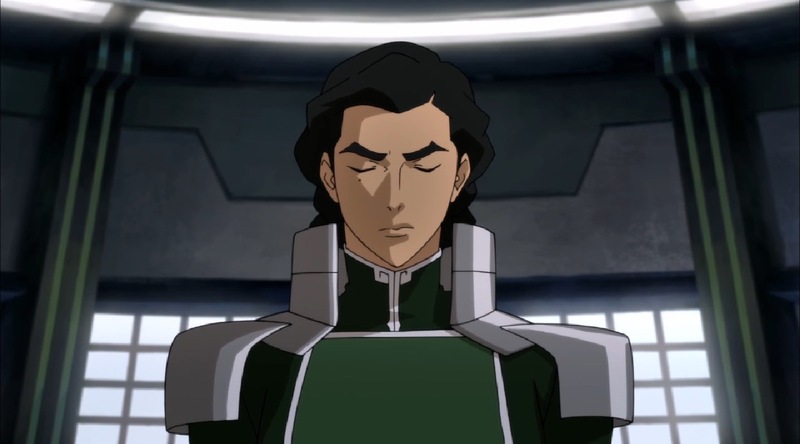 “Kuvira’s Gambit” is the kind of episode that makes me wish this series wasn’t about to end. The penultimate chapter of Book Four provides plenty for viewers to chew on as we look ahead to the impending finale. 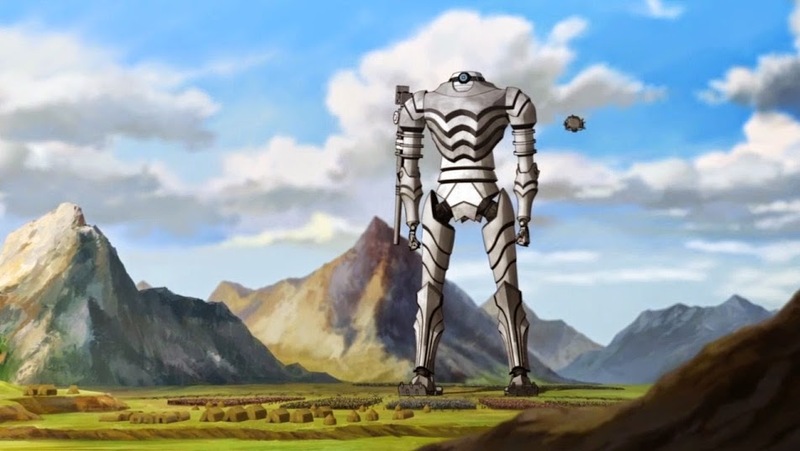 The largest of these elements is Kuvira’s newly revealed supermassive mecha suit. Nick revealed the titles for the two-finale to be “Day of the Colossus” and “The Last Stand.” Søren, Josh and I then excitedly speculated that the spirit weapon itself was the titular Colossus. We certainly have our answer now. The super-mech, undoubtedly forged with the metal from Zaofu’s dismantled domes, stands at “over twenty-five stories tall.” It’s a terrifying presence due in large part to the huge spirit cannon is mounted on its right arm. The behemoth suit is faceless but has an unmistakably, and fittingly, feminine form; Kuvira controls the suit herself from a shoulder mounted platform (the “head”). I enjoyed seeing the show’s influences shift this season. The Legend of Korra began with a 1920s-inspired design, most evident in Republic City’s Satomobiles and movers. Book Four, narratively and visually, has taken the show into the 1940s. Kuvira’s Earth Empire is clearly inspired by the fascist powers of World War II, and the initial cannon form of the spirit vine weapon bears a striking resemblance to the Schwerer Gustav, a railway gun originally built for Nazi Germany’s armed forces. The Colossus underlines the show’s more pronounced graphical return to the retro-future (Industries) motif of Book One. We’ve seen this style crop up periodically since then. Hiroshi Sato’s mecha tanks were part of the anti-bending revolution, and Book One’s final episodes pitted Korra against Sato in some direct hand-to-mech combat. I’ve always liked this look so I’m delighted to see it return. The Legend of Korra has put mechs to brilliant use in Book Four. 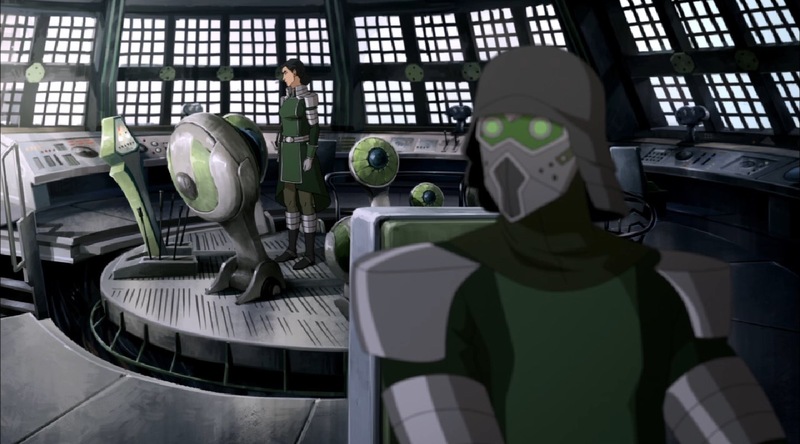 In particular, Bolin, Varrick, and Zhu Li’s fight against Kuvira’s suited-up soldiers in “Enemy at the Gates” offered some of the best animated sequences of the season. I’m excited to see the combat play out as Team Avatar takes on the Colossus. A showdown that blends organic with industrial aesthetics will surely feature striking imagery. This episode makes it clear that the endgame is upon us. The pressure is on. Christmas Kuvira’s attack has come early, and the leaders of the United Republic scramble to protect their people. From a central communications room, Mako takes to the airwaves and announces a mandatory evacuation. The phone lines ignite with calls from terrified citizens as Mako labors through detailed instructions. Prince Wu, much to the group’s (and my own) surprise, takes the microphone and delivers an impassioned speech explaining the necessity to retain composure in the face of chaos. I found his words saccharine and largely melodramatic. Thankfully the Republic City masses didn’t share my opinion; the prince’s approach works and the evacuation proceeds without a hitch. Wu’s turn for the mature doesn’t feel out of character. The sudden moment offers a fitting close for his development. Wu’s arc will probably also get an epilogue of sorts by the end of the finale even if this scene provides a satisfying denouement on its own. Zhu Li’s character arc isn’t resolved as cleanly even after she reveals her true allegiance to Varrick. When they reunite, they yet again they share a tender moment that almost skews romantic in a similar vein to their encounter in “Enemy at the Gates.” Zhu Li expresses her feelings and Varrick, heartbreakingly, doesn’t reciprocate. Instead, just as before, he reverts to selfishness and dismisses her to complete a task. The bait and switch moment is tremendously frustrating. Zhu Li’s sudden rebuke is all the more satisfying to watch. She wants Varrick to treat her as an equal; I couldn’t agree more. I hope that showrunners Michael DiMartino and Bryan Konietzko offer some resolution to their relationship before the series ends. 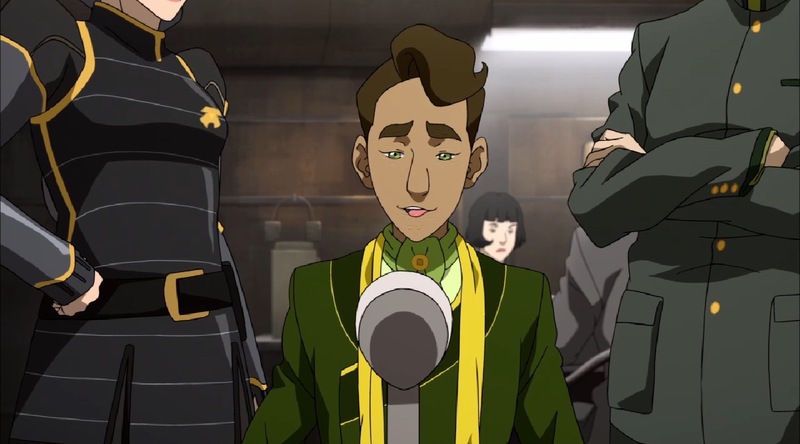 Although it is far from priority in the grand scope of the season, I would still like to see Varrick break from his selfishness and exhibit genuine emotion towards Zhu Li, who repeatedly shows that she cares the most about him. I’d love to see the two of them find some amicable closure together – romantic or otherwise. 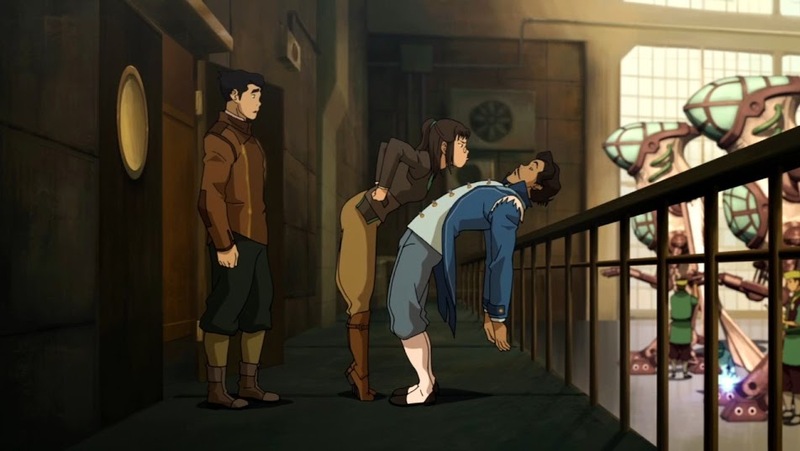 Korra remains a commendably level-headed leader through the rapidly unspooling situation in Republic City. She orchestrates Baatar, Jr.’s capture and proves effective as a tough negotiator. Well, almost effective: Korra’s attempt to exploit Baatar, Jr.’s love for Kuvira prompts the Great Uniter to locate and fire at Team Avatar’s hideout. Korra and the others run from the blast and the shot cuts away to show the Future Industries building smoldering. We are left wondering who survived the explosion. Søren and Josh noted in this week’s “Ember Island Airwaves” that Mako seems to disappear from the frame as the group runs from the energy beam. I don’t think the showrunners would bother to kill any character at this point. For now, I’m just hoping that everyone made it out alive. In the final shot, Kuvira takes a deep breath and relaxes. Her eyes are closed and her face is partially tinged with melancholy, but she seems more satisfied than upset. Her “gambit,” then, is in the tradition of chess. She reduced her fiancé to a pawn and sacrificed him for the sake of her larger plan. But what will that next move be? No better time than the “Day of the Colossus” to find out.